Where do you want to go birding in Alaska today? The Arctic National Wildlife Refuge -- home to polar bears, caribou, and millions of migrating birds ­- is under attack. Big oil interests want to drill in the biological heart of this spectacular wilderness. Click here or here to find out more. on the web about birding trips to St. Paul Island while planning my June '97 trip to the Pribilofs. I made this page to provide a bit more for birders contemplating a trip there." The Pribilof Islands of Alaska are a small cluster of four islands located about 250 mile north of the Aleutian Chain and are known for their rich bird life and fur seals. The only way to visit is on a "St. Paul Island Tour", put together by Reeve Aleutian Air and the local native corporation, Tanagadusix Corp.
....Birding in Nome - May 25 - 29, 2001. Your webmaster's visit to Nome! A lengthy trip report with detailed maps, a bird list and MANY photos. ....Birdwatching in Nome - Nome is a little know treasure for birders. The city of Nome is bounded by tundra on three sides and the Bering Sea coast on the other. Small ponds on the edge of town attract migrants before larger bodies of water and ice free. Once the ice begins to break up, migration begins. Virtually the entire area of the Seward Peninsula that is accessible by road from Nome is comprised of extremely valuable nesting areas for many bird species including most North American waterfowl. Rush days as one of the wildest towns in Alaska, Nome still lives up to its reputation. However, claim jumpers, crooked judges and light-fingered saloon dollies are things of the past. Now the wild time is provided by real wildlife. and I ventured north to the land of the midnight sun last week. Actually, we were just south of the Arctic Circle, but it remained light for the entire duration of our visit to Alaska. us on an 'adventure' tour of the sights of Gambell. Although you may see many of the bird species found at Gambell in the accompanying galleries, we have left this gallery page as a scenic tour of a visit to this remote island in the Bering Sea. extracts from Sandy Komito's latest book "I Came, I Saw, I Counted" chronicling his exhausting adventures during his North American Big Year quest in 1998. Sandy went on to shatter records in this year tallying a grand total of 745 species. The article can be found in the Features section of this website. trip reports on Attu and other Alaskan sites. ....Attu Island, Alaska - Images of the Island - A Birder's Paradise! by Monte and Christopher Taylor. Attu - the name yields many special thoughts for those who have been there, and a mystery and a sense of anticipation for those who haven't! (comprised of a large proportion of tidal and submerged lands in Orca Inlet, near Cordoba, Alaska and extensive intertidal and freshwater wetlands and the barrier islands near the mouth of the Copper River). Another site on the Delta. highest mountain, 20,320' Mount McKinley. The Park was designated an international biosphere reserve in 1976. 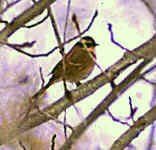 ....Birding Sites in Anchorage - by the Anchorage Audubon Society. Anchorage is a surprisingly good birding area. We have a variety of habitats: coastal, forest and alpine, and the city is situated at the edge of three major flyways. Check out Anchorage Birding Tours for a great way to get to the best spots! See also Tina MacDonald's report on Potter's Marsh. ....Birding in Alaska - lots of links to birding sites in Alaska. small, the annual visitors are spectacular. All four species of Eider ducks migrate along the coast and nest in the tundra around Barrow. Numerous other ducks and waterfowl also nest in the millions of small puddles and lakes across the tundra. Barrow is also prime habitat for many shorebirds. Site includes a check list of birds found in Barrow. nicest places to go birding. The combination of mountains, forest, wetlands, intertidal, and marine habitats, all accessible from the Juneau road and trail system, provides for extensive and diverse birding opportunities. See also the Juneau Audubon website. birding around the Fairbanks, Alaska area. some bird watching, but you're not sure where the best spots are? Here is a list of locations in the Fairbanks area that offer good opportunities for viewing local and migratory birds. guide by Tina MacDonald. See also Birding the Kenai Peninsula, 2000 and Birding the Kenai Peninsula, 2001. ....Kodiak Island Birding - by by the Kodiak Visitors Bureau. River. The City of Wrangell, located at the northern end of Wrangell Island, overlooks the mouth of the Stikine River and the Stikine River Delta. The Stikine River delta is a significant stopover on the Pacific Flyway for migrating birds. The delta is 11,000 hectares (27,200 acres), and 16 miles wide. trip report by Bert and Shari Frenz that describes their "trip of a lifetime". The itinerary chronicles their time in Alaska, British Columbia and Yukon territory. ....Trip Report: Alaska, 24 May - 16 June 2004, by Mary Beth Stowe. This report covers Gambell, Nome, Anchorage. the Pribilofs, Denali, Seward and Kenai and Barrow. Helen Baines. The following is a write up of the birding opportunities possible while taking a cruise from Alaska, south along the Inside Passage to Vancouver. It also includes 2 days of birding in Anchorage prior to the beginning of the cruise. with Society Expeditions aboard the "World Discoverer" - by Angus Wilson. This trip report covers a cruise of more than 2000 nautical miles through the Aleutian Island chain from Seward, Alaska to Petropavlosk on the Kamchatka Peninsula, Russia. Although a number of islands within the chain have been birded on a regular basis, the most notably being Attu, relatively few birders have had the good fortune to explore the length of the archipelago, and even fewer groups have been able to visit the Russian Commander Islands. Columbia and Alaska - 2 - 13 July 1991 by Blake Maybank. During the first two weeks of July, 1991, I was fortunate to have a meeting scheduled in the S.W. Yukon, with an itinerary requiring a visit to all the national and historic parks in the area. I managed to fit in as much birding as possible before and after each day's conclave, and while travelling between sites. In addition, at the conclusion of the event, I took several days off to bird as intensively as possible. In recounting my experiences, I hope to leave you with a better understanding of this rarely birded, but quite accessible, corner of Canada (and Alaska). reports are available from Blake Maybank's "Birding the Americas - Trip Report and Trip Planning Repository". Celebrate spring with the second largest spring time concentration of Bald Eagles in the world and flocks of shorebirds on Stikine Flats. Relish the roar of Stellar Sea Lions, watch for Harbor Seals and Orcas feeding near shore, and enjoy festivities such as birding workshops, a treasure hunt, native Alaskan artists, a street fair, golf tournament, and much more. Contact: Wrangell Chamber of Commerce, PO Box 49, Wrangell, AK 99929; 800-367-9745; fax 907-874-3905. May 2 - 06, 2001. In early May, the tidal flats of the Copper River Delta shimmer with the activity of hundreds of shore birds. As many as 5 million shorebirds rest and feed here during spring migration. The Copper River Delta Shorebird Festival is the ideal opportunity for bird watchers to be part of this epic migration. ....Kachemak Bay Shorebird Festival, Homer, AK - May 9 - 12, 2002. Over 100,000 shorebirds of 25 or more species utilize the tide flats within the city of Homer as a staging area during migration to their arctic breeding grounds. See Common and Pacific Loons as they arrive to the beautiful lakes and rivers of Mat Su Valley, just north of Anchorage. Also enjoy Red-necked Grebes, many species of ducks, Sandhill Cranes, White-fronted and Snow Geese, Tundra Swans, and enough Bald Eagles to scare you! Contact: Anchorage Audubon Society, PO Box 101161, Anchorage, AK 99510; 907-345-3139. Lower Kuskokwim Economic Development Council, P.O. Box 2021, Bethel, Alaska, 99559; (907) 543-5967. ....Alaska Bald Eagle Festival - Haines/Chilkat Valley. November 7 - 11, 2001, Haines, Alaska. Three-day celebration of the winter population peak of eagles: educational seminars, family and special events. For more information, call (800) 246-6268 or (907) 766-2202.
birdingpal.com...>> A Birding Pal is not a paid guide, but someone who likes to help out of town visitors. You can become a Birding Pal today! Help someone to enjoy your local birding spots and find a pal to help you when you travel. Click here for Alaska Birding Pals, or join to be a Birding Pal! Hotspots where over 150 species of birds have been sighted. You may see Bald Eagles, Arctic Terns, Yellow Rumped Warblers, Loons, Bonaparte Gulls, Red-Neck Grebes, Barrows Goldeneye, Red-Necked Phalaropes, and many many more birds living and nesting in the Anchorage Alaska area. descriptions with photos, and much other information on St. Paul Island. Professional guides will show you the abundant and diverse wildlife of St. Paul Island, in the Alaskan Pribilofs. These tours are designed for wildlife enthusiasts, bird watchers, and photographers seeking a truly unique destination. **..Bering Sea Cruise with Victor Emanuel Nature Tours (VENT). The opportunities for seabirds and landbirds on this cruise are fantastic. The Kuril Islands, Kamchatka Peninsula, plus the Bering Sea and the Pribilof Islands are among the places you dream of in your wildest fantasies. Now with VENT and the advent of expedition cruise ships, you can enjoy the opportunity of witnessing one of the wildest, most spectacular places on our planet, and all from the comfort of a beautifully appointed ship, Society Expedition's World Discoverer. Bering Sea Cruise May 24 - June 11, 2001 (19.0 days - Limit 59) with leaders Victor Emanuel, Robert Bateman, David Bishop, Lars Jonsson, Kenn Kaufman, Peter Kennerley, Peter Mathiessen, and Barry Zimmer. When spring arrives on the shores of Alaska and Siberia, and thousands of birds rush northward to claim their nesting territories, some of these small navigators make big mistakes. Every year a number of Asian migrants end up on North American soil. Birders have learned that they can intercept some of these strays by positioning themselves at strategic points in western Alaska.The Eskimo village of Gambell, on St. Lawrence Island, is one such strategic point. Gambell/Nome, Alaska May 25 - June 01, 2002 (8.0 days - Limit 16) with leaders Kevin Zimmer & David Wolf. designed for birders with limited time, offers a surprisingly complete cross section of the birds. It focuses upon three very different areas: breathtaking Kenai Fjords National Park and the adjacent Kenai Peninsula; the sprawling wilderness in the shadow of majestic Denali (Mt. McKinley), North America's highest peak; and the rugged hills, tundra, and seacoast around the old gold-rush boomtown of Nome. above), Grand Alaska, and the Barrow Extension may be taken separately or in combination. Taken in concert they comprise the most complete and exciting Alaska birding tour available. Grand Alaska May 31 - June 15, 2002(16.0 days - Limit 16) with leaders Kevin Zimmer & David Wolf. See also the Barrow Extension June 15 - June 17, 2002 (3 days - Limit 21) with leaders Kevin Zimmer & David Wolf. 322 pages 4th edition (May 1995). Wildlife biologist Robert Armstrong's classic is back in print, with new photos, a new design, and the latest, most accurate information on Alaska's resident birds, along with its casuals and accidentals. Updated to include all 443 species of Alaska's birds, its portable size and lie-flat binding make it easy to pack and durable for field use. 550 color photos. 1 color map. Seasonality and Natural History - by Brina Kessel. Hardcover (June 1989). 1994). On our trip to Alaska, we used this book every day, and it led us to some wonderful places and some marvellous birds - Tina. 1993; 76 pages; booklet. Covers the birding possibilities in Alaska’s Interior, from the eastern border near Tok up the Alaska Highway to Fairbanks. Also covers the Steese Highway to Eagle Summit, and the loop made by the Parks Highway to Denali Park, across the Denali Highway to Paxson, and back up the Glenn Highway. Has checklist and a habitat guide for birdfinding. Excellent maps. Scroll down the ABA page to find this item. Published 1994; 153 pages; plastic spiral binding. Birdfinding instructions and detailed maps take you from Anchorage south to Seward, including the Chiswell Island seabird colonies and Kenai Fjords National Park; then through Kenai NWR to Soldatna and Kenai on Cook Inlet; south to Homer, Gull Island, and on a cruise on lower Cook Inlet to the Barren Islands, site of the largest seabird colony in the northern Gulf of Alaska. Thorough, accurate coverage of an area with much to offer birders. Scroll down the ABA page to find this item. George C. West. Published 1993; 32 pages; booklet. Species accounts of the region’s shorebird species are illustrated with fine line drawings showing standing postures and flight patterns as an aid to identification. Handy, pocket-size guide for a must-visit area at the tip of the Kenai Peninsula south of Anchorage. Scroll down the ABA page to find this item. Annabell Lund, Annabel M. Lund. Paperback - 96 pages 1 edition (May 1996) The Alaska Wildlife Viewing Guide is your ticket to 68 of the best places to watch wildlife in the 49th state, from the rain forests of southeast Alaska to the coastal mountains to the fabled Interior to the northern tundra. The only statewide, comprehensive guide to watchable wildlife, the Alaska Wildlife Viewing Guide is perfect for Alaska residents out for the weekend or out-of-state visitors on the trip of a lifetime. 400 pages 1 Ed edition (March 1998) Photographer, world traveler, and author Paul Otteson takes a region-by-region look at America's largest state, exploring its vast wilderness, rich wildlife, and inspiring natural wonders. Planning and preparation resources are also listed, as well as advice and information on when to go, packing, finding seasonal work, costs, and transportation options. Photos, many in color. Maps.